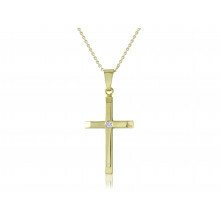 This classic cross Pendant is filled with light thanks to the 26 sparkling Cubic Zirconia and its polished yellow Gold setting. A beautiful way to wear this meaningful and spiritual symbol. The Necklace has a fine yellow Gold chain which can be worn at 16" or 18".